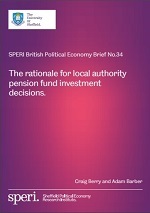 A new report published today by SPERI assesses the rationale behind the strategic asset allocation of the UK’s largest local authority pension funds since the 2007/2008 financial crisis. The analysis in this new SPERI British Political Economy Brief by Craig Berry and Adam Barber builds directly upon that of our previous Brief, Local Authority Pension Fund Investment Since the Financial Crisis, which charted changes in the investment patterns of pension funds between 2005 and 2016. The full publication can be downloaded here. Through its series of British Political Economy Briefs, SPERI aims to draw upon the expertise of its academic researchers to influence the debate in the UK on sustainable economic recovery.